Here is another reminder about the Tamaqua Spirit of Christmas Festival. The festival lasts today until Sunday. 6 PM –> Santa Parade & Depot Square Park Illumination (via Tamaqua Area Chamber of Commerce). 6 PM to 8 PM –> Indoor Tree Festival Display Voting and Artist Market at Tamaqua Community Arts Center, 125 Pine Street. 6 PM to 8 PM –> Community Christmas Party at Tamaqua YMCA, 1201 East Broad Street. (Santa, snacks and kids activities). 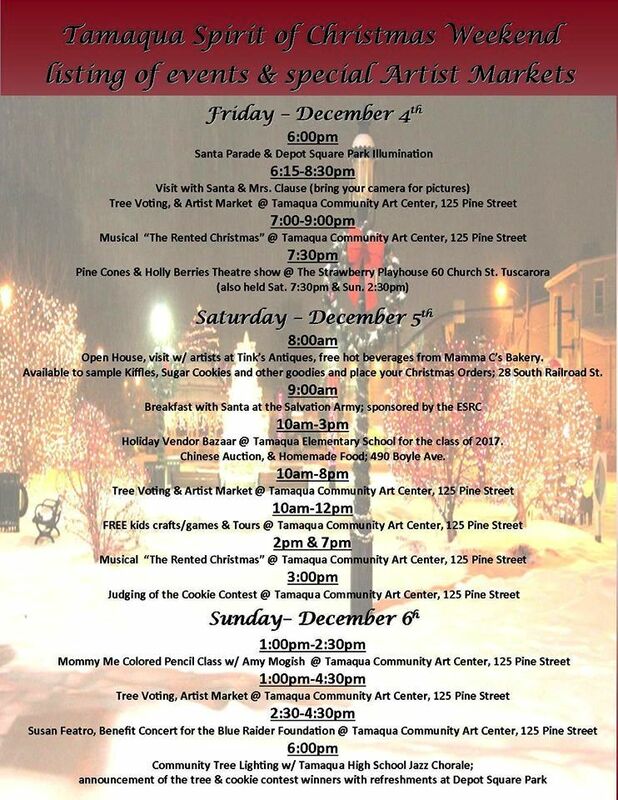 6:30 PM to 8:30 PM –> Visit with Santa & Mrs. Claus at Tamaqua Community Arts Center, 125 Pine Street. (via Tamaqua Area Chamber of Commerce). Next POLL: When Do You Start Decorating For Christmas?